Believers praying in the central jami named after Akhmad Kadyrov in Grozny. A variety of ancient Islamic manuscripts were brought to Russia during the enlightened reign of some of the country’s greatest rulers, like Peter the Great and Catherine the Great. 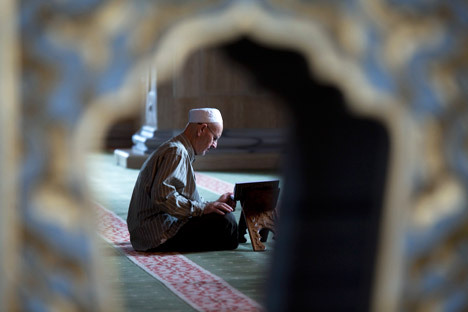 RIR profiles the five most interesting manuscripts of the Koran in the country. A copy of the Koran which Central Asian Muslims have revered for many centuries and considered among the earliest manuscripts of the holy book is at the Institute of Oriental Manuscripts in St Petersburg. Recently, a fragment of Osman’s Koran was found in a small village not far from the Uzbek-Afghan border. Fragments of old Kufic Korans take pride of place in Russian museum collections. Among them is one collection which belongs to the Russian National Library in St Petersburg. It originates from the Mosque of Amr ibn al-As in Old Cairo (built in 643). The library’s collection is the largest in Europe and among the largest worldwide, in terms of the number of Kufic (the oldest calligraphic form of Arabic script) manuscripts. An important part of that collection is a considerable fragment of one of the oldest manuscripts of the Koran, the second part of which is now kept at the National Library in Paris. A unique manuscript of the Koran is kept at the Russian State Archive of Ancient Acts in Moscow. An inventory of the archives of ‘Posolsky Prikaz,’ (then the ministry of foreign affairs) compiled in 1560, under Tsar Ivan the Terrible, mentions “a Tatar Koran that is used in oath ceremonies”. What has survived till the present day is a copy of the Koran that was used by Muslims when taking an oath and being sworn in. In it, Ayat 16:91 that was used while taking an oath, is written in gold letters. Three miniature, octagonal Korans, which traditionally formed part of Islamic army banners, are now kept at the Peter the Great Museum of Anthropology and Ethnography (Kunstkamera) of the Russian Academy of Sciences. Another unique copy of the Koran is a miniature of the holy book which belonged to the famous jeweller Karl Faberge, who bought the tiny manuscript to mark the completion of a long-term commission from French Princess Cecile Murat.